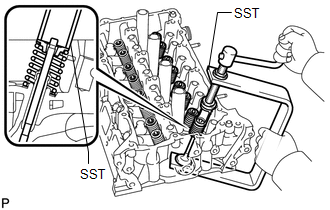 (a) Using SST and wooden blocks, compress the compression spring and remove the valve spring retainer locks. 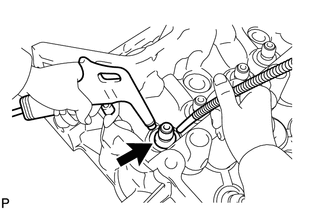 (b) Remove the retainer, compression spring and valve. 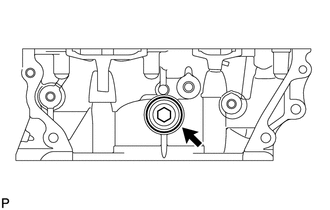 (a) Using needle-nose pliers, remove the oil seals. 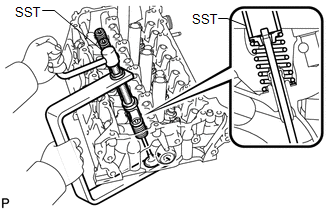 (a) Using compressed air and a Magnet Hand, remove the valve spring seat by blowing air onto it. If water leaks from the No. 1 screw plug or the plug is corroded, replace it. 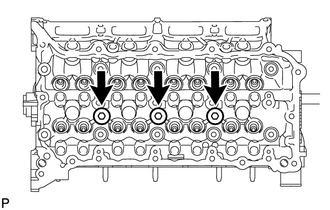 (a) Using a 10 mm hexagon wrench, remove the 3 screw plugs and 3 gaskets. If water leaks from the No. 2 screw plug or the plug is corroded, replace it. 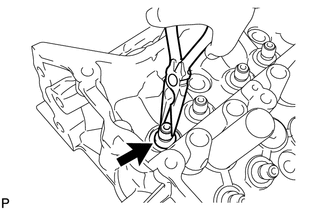 (a) Using a 14 mm hexagon wrench, remove the screw plug and gasket.